I’m very close to submitting the complete rewrite of my I May Be Late application to the AppStore, so I thought it might be a good idea to do a quick run through of the application, pointing out what I have changed and highlighting new features. The first change I’ve made is to the Status screen. I’ve decided to just show the status without making the user login or signup. By doing this, I hope I can show that my status screen is nice and bright and easy to use. I’ve taken the idea from Instagram and displayed a help popup, that gives a quick explanation of all the features of the app, hopefully encouraging people to signup! Clicking through a line status row will now present you with both the status of the line and the status of any affected stations on that line. I think this is the first thing that differentiates my app from the competition. Station closures do happen and can totally derail your commute (pardon the pun!). 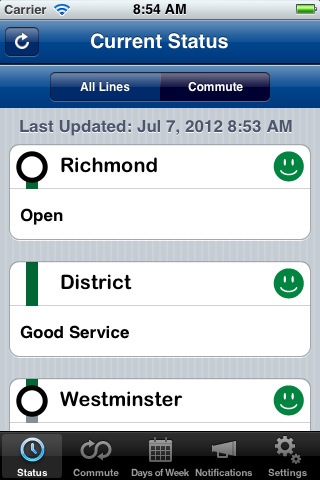 The second major change to this screen is the inclusion of the Commute filter. This won’t do anything until the you’ve logged in and added your commute, but it will then show you the status of the lines and stations on your route. Once you register, you’ll be able to see the full set of tabs that show all of the features. The first tab deals with your commute. 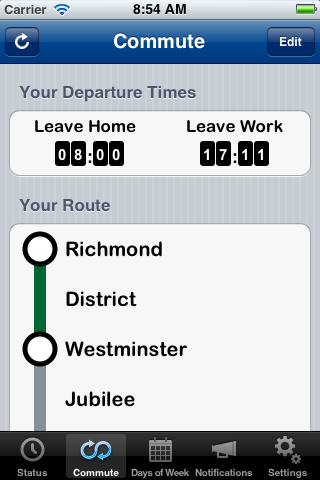 This will let you add your journey by choosing where you start and end your commute. 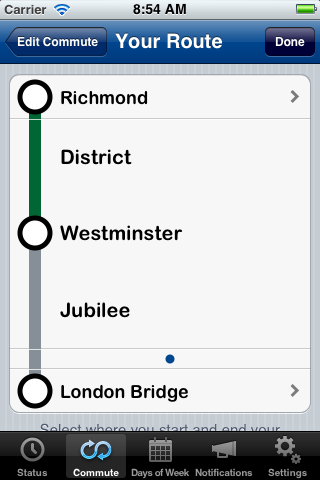 I’ve hooked into TFL’s journey planner to make this selection process as easy as possible. This screen remains unchanged. 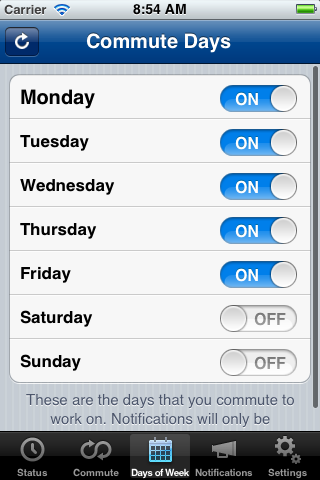 You just select the days of the week that you commute on. Simple choose the days. I’ve create a separate tab for the notifications to make them more accessible. I’ve made it simple by only giving two choices. 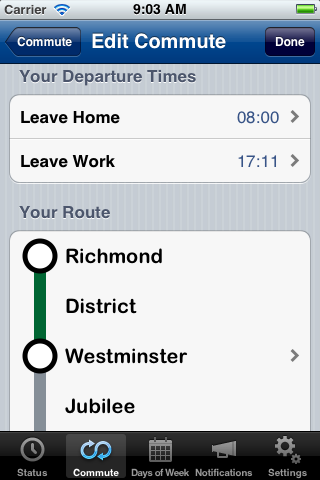 You can switch on Advance Notifications for each direction of your journey. There are two ways to notify others – email and SMS. 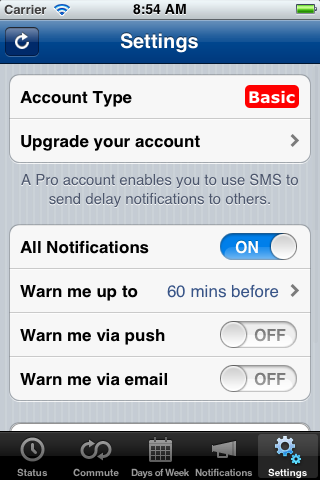 SMS is only available to Pro users as it costs money to generate the text messages. I think that most people will find the advance notifications the most powerful feature. The settings screen remains mainly unchanged. I’ve moved to using Apple In-App purchase mechanism. This is to make it easier for people to upgrade their account. It is also less code to maintain than the existing PayPal mechanism I was using. I’ve also made it easier to manage all the global settings for your notifications, making it simple to turn them off all in one go. 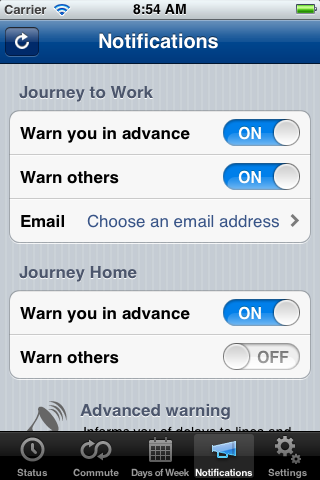 Notifications have been enhanced, so that there are two types of notification available to you. ← Now I’m just inventing words…. Good redesign, thumbs up! That welcome screen is an excellent idea. Thanks Stan. I hope it gets through the approval process in time for the Olympics! 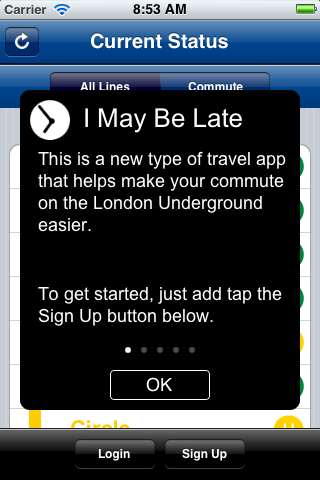 Love the commute screen Tomas! Thanks. 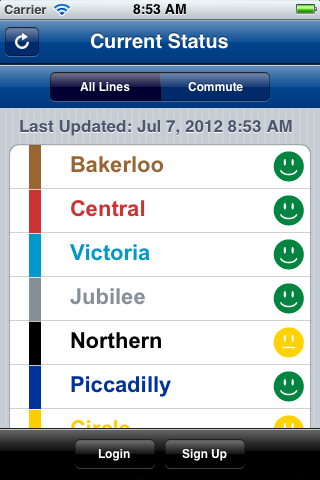 Are you a London Underground commuter?